Summary: A powerful brutal film that is not too preachy with eccellent performance from Leonardo DiCaprio and Djimon Hounsou. Marilyn Monroe famously sang “Diamonds Are a Girl’s Best Friend” in the film Gentlemen Prefer Blondes. According to Blood Diamond, however, sparkly jewels seem to bring mostly misery to those who seek them. Let’s make no mistake, Blood Diamond is intended to be a ‘message movie’. That message is that the trading of “blood diamonds” (a diamond mined in a war zone and sold so as to help finance one of the sides involved in the conflict) is having an devastating effect on the lives of millions of Africans. Those who buy the diamonds, generally people from first world countries, are complicit in the perpetuation of their suffering. Your money goes on buying guns. These guns are often put in the hands of children who’ve been brainwashed into becoming ruthless little fighting machines for their commanders. Think about that, director Ed Zwick is telling you, next time you’ve got your beak pressed up the window of H. Samuel looking at the shiny shiny rings. 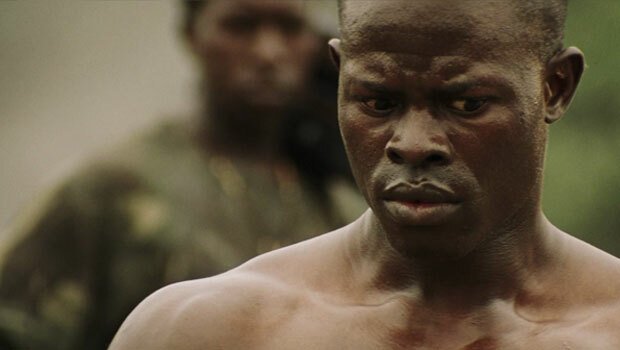 This message is conveyed through the story of Solomon Vandy (Djimon Hounsou). He’s a fisherman who is living a simple life on the Sierra Leone coast until one day RUF (Revolutionary United Front) rebels arrive in his village. His wife and children flee, but he is forced to work for them, panning for diamonds that can be given to the likes of Danny Archer (Leonardo Di Caprio) in exchange for guns. Archer is a former South African soldier, turned mercenary, turned smuggler who is looking for one last big score that will let him leave the continent behind. Archer thinks he’s found it in the shape of Solomon Vandy. The noble fisherman has buried a large diamond he found while enslaved by the RUF, which Archer plans to retrieve and sell. But between them and the diamond lie not only the RUF, but also a group of South African mercenaries, led by Archer’s former mentor Colonel Coetzee, who’ve been hired by the government of Sierra Leone to defeat the rebels. Meaning that this message film also has its fair share of exciting battle scenes in which Mr Di Caprio gets to do his best James Bond impression; a morally ambivalent anti-hero able to escape the clutches of his considerably better armed enemies relying only a pistol and his wits. And we get a love story too. Idealistic American journalist Maddy Stone (Jennifer Connelly) is appalled by how cold Archer is but is trying to use him to get a story. Low and behold, he isn’t as cold as he first seems. This subplot and the slick action scenes would seem to detract from, rather than emphasise, the central theme of the film. It also has the effect of placing Leonardo Di Caprio as the hero, with Djimon Hounsou sidelined as a cliché, the noble African. That’s not to criticise the performances of either, they can only use the script that they’re given. While Blood Diamond sets out in beginning to be a message film, it returns to this notion only periodically between the explosions and the longing looks. I’m not certain, but this is perhaps because the writer of Blood Diamond, Charles Leavitt, wasn’t sure if the film could change the opinion of the audience. On one hand Maddy Stone says that if people at home knew that about what went on in Africa then they wouldn’t buy the diamonds. On the other, later in the film she is asked if her government will send help once they read her reporting of the conflict in Sierra Leone, she says “probably not”. I know the actions that individuals would like their government to carry out and the actions that governments actually carry out are often very different; public uproar wouldn’t necessarily mean that the Marines would be sent in. It would help though. The thing is, I’m not sure I have her faith that diamonds would cease to become a girl’s best friend if only the girl went to see this film at her local multiplex.